These easy silver dollar pancakes with almond flour look and taste just like normal pancakes. Enjoy them with sliced butter and sugar-free syrup. Keto, low carb, and gluten free. In a bowl, combine all dry ingredients (almond flour, sweetener, salt), stirring or whisking until well-mixed. Add all remaining ingredients (heavy cream, egg whites). Stir together until smooth. If the batter is too thick, or if you prefer thinner pancakes, stir in 1 tablespoon of water. Heat a pan on the stove until hot. Pour batter to form a 3-inch pancake, about 1 to 2 tablespoons. Cook and then flip to cook the other side. Transfer to a plate when done. Repeat until the batter is used up. Serve with butter and sugar-free syrup. 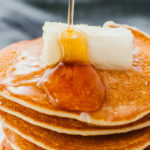 This recipe yields 3 g net carbs per serving (about 5 silver dollar pancakes).